Why did Lisa Lamsen fly to Pittsburgh on a Friday in February 1987, only to turn around and fly back home to North Carolina? Somewhere over Virginia, the psychosis she’d been experiencing for several days suddenly subsided. Able to think clearly again, she knew she’d been expected to check into a psychiatric hospital that morning instead of flying off to visit a man she barely knew. What caused her to become psychotic at age 30? Attraction (the man in Pennsylvania)? Guilt (she’d left her husband six months earlier)? Genes (it ran in the family)? Manipulative friends (Gabe and Colby, who’d been playing friendly mind games with her before they turned ugly)? Lisa spends time on two locked wards at Shelter Hills Hospital in Greensboro, NC. One seems more like a camp for sad adults; it's populated by patients who are struggling with relationship issues and disorders like depression and anxiety. Lisa figures only one person there is sicker than she is, a young man who takes four small cups of pills every day and still think the pool balls are talking to him. The other is the chronic ward, where most patients stay in their rooms. The ones she meets there are the severely mentally ill. Lisa hopes she's not seeing her future in them. Misdiagnosed and overmedicated, Lisa eventually leaves the hospital and goes off her meds. She spends time in an alcohol rehab facility because her uncle thinks she’s a “dry drunk”. She meets a television producer, a doctor, a model, and many other colorful characters there, and learns that alcohol is not her problem. The dopamine in her brain is. 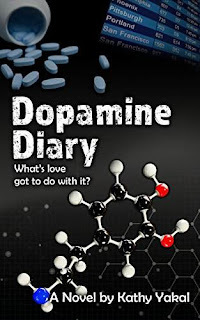 Much of Dopamine Diary is set in the workplace and among Lisa’s other friends, as she tries desperately to be who she was again before her brain chemistry took a detour. Dopamine Diary is a novel about mental illness, friendship, and love.